Thinking About Investing in a Pre-Construction Condo? 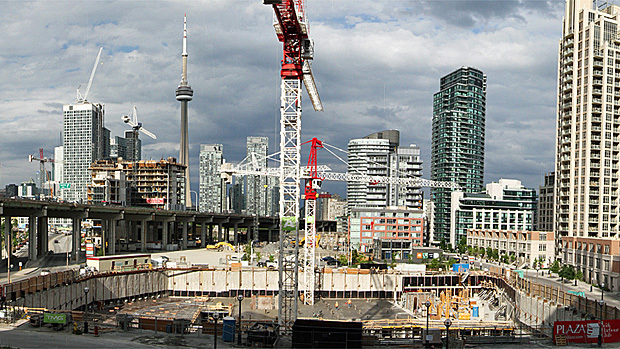 Home » Downtown Toronto Condos » Thinking About Investing in a Pre-Construction Condo? "People that work outside the condo industry are heavily influenced by what they see and what they read. If you drive down the Gardiner Expressway into downtown Toronto, condominium apartment buildings are popping up like dandelions. Seemingly every week, Torontonians are warned about the impending doom that all these condos will bring to buyers in the GTA and the overall Canadian economy. I typically start by stating the facts — the new and resale condo markets are up in the GTA, and condo rents are also up. All of this has occurred despite the massive influx of new supply, nearly 28,000 new condominium apartments have completed over the past 12 months in the Toronto area per CMHC, a record high that may never be topped. However, I always stress that when buying a pre-construction condo, you are not buying into today’s market conditions, depending on the size of the project, you are buying into market conditions in three to four years when the building is completed. I then suggest holding the unit and renting it for the long-term. Once they understand and buy-in to those points, the logical next question is: What are your thoughts on the long-term prospects of the condo rental market in Toronto? I think they are very good. Due to affordability and a need for flexibility, I see more young people choosing to rent moving forward. Based on Fortress’ experience in major urban markets across Canada, I see an increasing desire to live downtown, close to employment, entertainment, transit and other amenities. Other trends include fewer cars, more bikes and more strollers for the boom in condo babies! Perhaps the next hot selling suite will be a one bedroom plus nursery. Despite the record number of units being built, the influx of investors, and the numerous warnings, condo apartment rents have increased in each of the last five years in the Toronto area per CMHC, jumping an average of 4.1% annually. I definitely see this trend continuing."